On the outskirts of Dhaka, the capital city, in the industrial zone; workers' rioting and demonstrations yesterday escalated to new heights. As thousands of workers gathered in the morning, at 10am a group set off towards the nearby Dhaka Export Processing Zone where many garment factories are located. Police blocked their way and fierce fighting began - in the pitched battle police teargas and rubber bullets left 100 workers injured. There are reports that some workers at the Hamim complex tried to defend the factory and clashed with the demonstrators as they approached (presumably reluctant to sacrifice their workplace to the greater cause - though whether these workers were garment workers or factory security and/or management personnel is unknown). The approaching protesters were said to be angry that these workers had failed to join the weekend protests over the killing of two garment workers shot by cops - and that the factory owners had, unlike other bosses, continued operating since the shootings. The workers split into smaller groups and stormed the complex at around 10.15am. 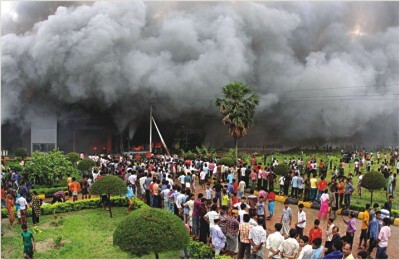 They sprinkled the buildings with petrol; a sweater factory, three garment factories, two washing factories, two fabric storehouses ... over 8,000 machines, a huge quantity of readymade garments, fabrics, three buses, two pickup vans, two microbuses and one motorbike were all reduced to ashes. Meanwhile, groups drawn from some of the other 50,000 workers and participants (undoubtably other sympathetic non-garment workers and slum dwellers would have been drawn in) roamed the area and attacked and vandalised another 50 factories and 20 vehicles. Thick black smoke could be seen across the city. The current global meltdown had a background part to play in the whole thing as scores of factories turned sick due to reduced orders. The closure of the units of S Suhi Industrial Park Ltd was mainly responsible for the latest labour unrest in garment factories in Ashulia and Savar areas, a number of garment workers claimed. Pretty Group in March started production only with the sweater-manufacturing unit and kept the five other units of the former S Suhi Industrial Park closed. Around 1,000 out-of-work workers of the five units were mounting pressure on the new management to restart those units soon, said garment workers. The workers of the closed units along with other ill-paid workers of some nearby factories, which are not doing so well, started a movement to reopen the units and raise salary of workers, they said. Manjur Rahman, manager and company secretary of Pretty Group, claimed that this labour unrest had neither anything to do with his factory nor was it triggered from his factory. In fact, the truth is probably a little more subtle - the Pretty Group dispute was the spark that set off an explosion waiting to happen. The global economic crisis increases already pressured working conditions, decline in real wages/purchasing power due to inflation and actual or threatened unemployment; in Bangladesh a decline in income is a short step away from hunger and starvation; many garment workers are already permanently malnourished (as described here; http://libcom.org/news/bangladesh-militarized-factory-visions-devouring-demons-capital-15092008). Where this workers' movement goes from here is anybody's guess. But the ruling class is worried it may spread to the south-eastern port city of Chittagong, another smaller center of the garment industry, with 700 factories. 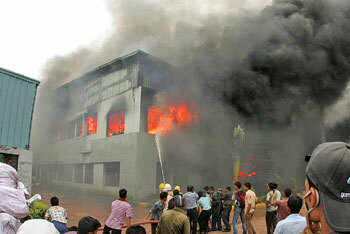 Security has been beefed up with special surveillance over the Chittagong city’s apparel sectors as tension brewed here against the backdrop of violence in the garment factories in Dhaka, police officials and garments association leaders said on Monday. thanks again man. Are you there atm? Yes sickdog24, I'm a jet-setting professional revolutionary - I've just parachuted in to this proletarian hot spot and I'm posting this on my laptop as I stand outside the smouldering ruins of another torched factory whilst posing for souvenir photos. Ret Marut you got me excited there. I was gonna jump on the next plane to syhlet to help with some betel nut plantation unionisation! but if your not there I think I shall stay where I am. If things are still going pear-shaped later this year I can send in a field report (going there for my cousin's wedding). That would be great, micapam. They weren't thinking strategically, just tactically - if they were thinking strategically, they wouldn't have burnt the factories. I understand the emotional need to strike back at the sweatshop system, and it's certainly a symbolic milestone, but in this sense the workers who tried to stop them were right. As valuable as the symbol of burning the factories is, the practical significance of keeping them intact is moreso. Of course the working class built the world once and we can do so again, but why destroy infrastructure when you can seize it? "We are not afraid of ruins - we carry a new world in our hearts" as someone with a million times more proletarian rage than K no K rightly said. Why seize the miserable infrastructure when you can transform it so it conforms to your desires? According to your abstraction, the workers should seize the infrastructure they were forced to build, so they can be stuck inside it. Sometimes you seize the infrastructure, sometimes you destroy it; to apply an abstract principle, to apply it regardless of historical time or circumstance or possibility, to a specific case of contestation is typical marxoid crap. If they'd seized the factories, the cops would have been sent in to evict them. Then what would your patronisingy expressed "practical significance" mean? Luddism without illusions about a golden age in the past is a radical application of the critique of the commodity and of its 'progress'. Destroying sweatshops is not 'symbolic' - unless everything outside of an immediate transformation of everything - a kind of global leap over a canyon a million times bigger than the one in Arizona - is simply "symbolic". And what great strategy do you have that's different from your tactics that you'd like to share with us (and with the State that's listening)? And what are your tactics ? You have changed your name because of socialist fight!!? There are several other people using Ret Marut as an author and/or a posting name online, none of whom's views I particularly want to be confused with; plus some German(?) punk(?) band. Then there is the original Ret Marut/B. Traven, which means I couldn't put a library tag on my articles here as Ret Marut. If I want to direct people to articles or if people google, it's just simpler.